Grab’s Earnings Guarantee scheme ensures that you receive a weekly guaranteed amount, based on the number of trips made according to your Emerald Circle tier. How does the ‘Guarantee’ in Earnings Guarantee work? If you meet the target number of trips in a week but your total fixed fare earnings is below the guaranteed amount, Grab will top up it up for you! Through this scheme, every driver’s hard work and consistency is rewarded! Sleep better at night without worrying about fluctuating income. Once you meet the weekly target of trips under your tier, Grab rewards you with its guaranteed earnings. Know that your efforts should be justified! Started in Emerald or Ruby? Don’t worry! We will review your Emerald Circle points every 2 weeks (instead of quarterly basis) and upgrade your Earnings Guarantee tiers! How is the weekly Earnings Guarantee calculated? Your weekly TOTAL FIXED FARE (excluding bonus, ERP, etc.) will be calculated against the trip tier you are in at the end of the week. Refer to the tables below for examples. How does the tier upgrade work? We will refresh your Earnings Guarantee tiers every 2 weeks. You can unlock higher tiers (up to Sapphire) within the same quarter. Refer to the below table for an example. What Service Type are Eligible? All GrabCar drivers and GrabTaxi drivers are eligible. Standard taxi, Limo taxi, and Electric taxi bookings are not eligible for the scheme. For GrabCar partners, all GrabAssist, GrabShare, GrabCar Economy 4 & 6-seater, GrabCar Premium 4 & 6-seater, GrabFamily 4 & 6-seater, and JustGrab bookings are counted. For GrabTaxi partners, all GrabAssist, GrabShare and JustGrab bookings are counted. Will Other Incentives Be Affected? GrabShare and GrabAssist commission cashback, GrabRental rebates, Super Steady, GrabCar Plus incentives will continue to be available. Q: How can I view my Earnings Guarantee weekly scheme (targets and amount)? A: You can refer to the Incentives tab in your Grab Driver App. Q: What is Emerald Circle? A: Find out all about Emerald Circle here! Q: I have collected enough points to unlock the next Earnings Guarantee tier (e.g. from Emerald to Ruby). Why is my Earnings Guarantee weekly scheme not updated in my app? A: We will be refreshing your Earnings Guarantee weekly scheme every 2 weeks (e.g. week of 12 Nov, week of 26 Nov, etc.). You can unlock up to the Sapphire tier within the same quarter (Diamond tier is by invite-only after the quarter ends)). Q: How is the weekly Earnings Guarantee calculated? A: Your weekly trip count and total fare collected (EXCLUDING bonus, ERP, etc.) will be tabulated and corresponded against the trip tier target. Commission on the incentive top-up is at 10% for GrabTaxi driver partners. Q: Do commissions apply for the Earnings Guarantee? A: Yes, Commissions apply to fare top-ups. Refer to the above question for an example. Q: Will I still receive my rental rebate if I signed up for this incentive? A: Yes, you will! Please refer to your rental fleet for more details on their respective terms & conditions. Q: What service type qualifies? A: For GrabCar partners, all GrabAssist, GrabShare, GrabCar Economy 4 & 6-seater, GrabCar Premium 4 & 6-seater, GrabFamily 4 & 6-seater, and JustGrab bookings qualify. For GrabTaxi partners, all GrabAssist, GrabShare and JustGrab bookings qualify. Q: What type of bookings are NOT counted? A: All jobs completed with MyDestination feature, as well as all metered fare bookings (Standard Taxi, Limo Taxi, and Electric Taxi) do not count as trips for the Earnings Guarantee. Q: What if I am in Ruby, completed 90 trips in the week, collected $1,200 in FIXED FARES, and meet the AR/CR/DR requirements? A: The Ruby tier Earnings Guarantee amount for 75 – 99 trips, is $975.00. As you’ve earned more than the guaranteed amount, there will not be top-ups. Q: Do commissions from the Earnings Guarantee top-ups count towards Emerald Circle points (XP)? A: Commissions from Earnings Guarantee top-ups do not count towards Emerald Circle points. Only commissions from completed bookings, including My Destination trips, are counted. Q: I am a GrabTaxi partner. Why are Standard Taxi, Limo Taxi, and Electric Taxi bookings not eligible for the Earnings Guarantee? A: The Emerald Circle Earnings Guarantee scheme is only applicable to Fixed Fare bookings from Grab. GrabTaxi partners from HDT Taxis, Premier Taxis, Prime Taxis, SMRT Taxis, and Trans-Cab Services, are eligible for JustGrab, GrabShare, and GrabAssist fixed fare bookings. Q: I’m a new Grab Driver. What am I be eligible for? A: Welcome to the Grab family! As a new driver partner, you will start with the Missions Schemes. 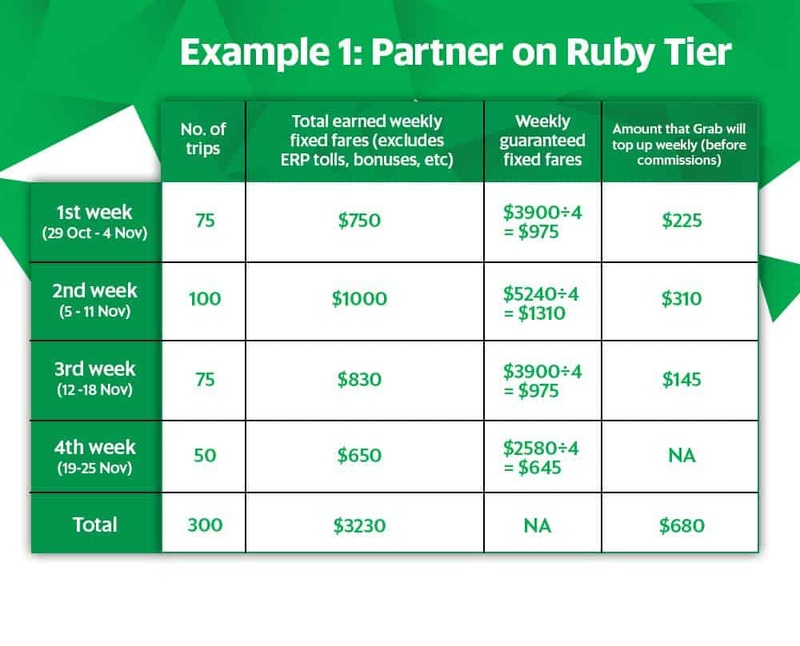 Driver Partners have to opt in to start with the Emerald Tier Earnings Guarantee Scheme. 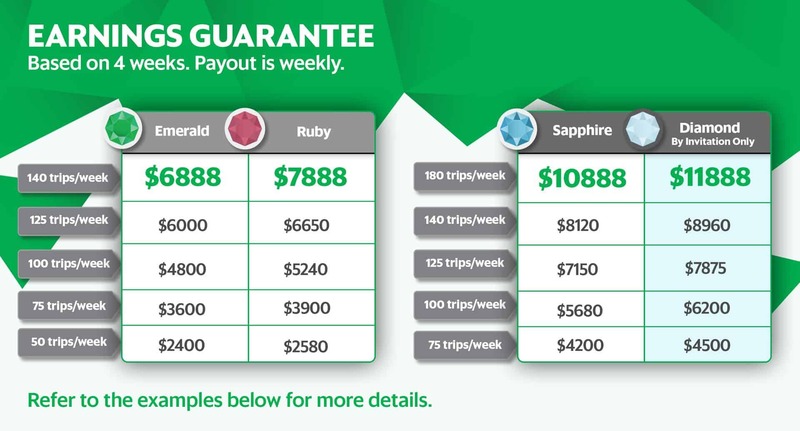 As you accumulate 8,500 points and 25,000 points by the Cut-off dates, you will be eligible for the Ruby and Sapphire Earnings Guarantee Schemes respectively. Q: I am converting from GrabCar to GrabTaxi OR GrabTaxi to GrabCar, will I still be eligible? A: As per our conversion process, you MAY not receive the earnings guarantee for a week. Instead, you will be receiving your respective scheme the following week. Kindly check your incentives page on the Driver App to check the scheme that you are eligible for. Q: I am a Grab Driver Partner driving for an Employed Fleet. Why am I still at Emerald even after completing so many jobs? A: As an employee of the Employed Fleet, you would not be paying any commissions that are counted towards points for Emerald Circle. 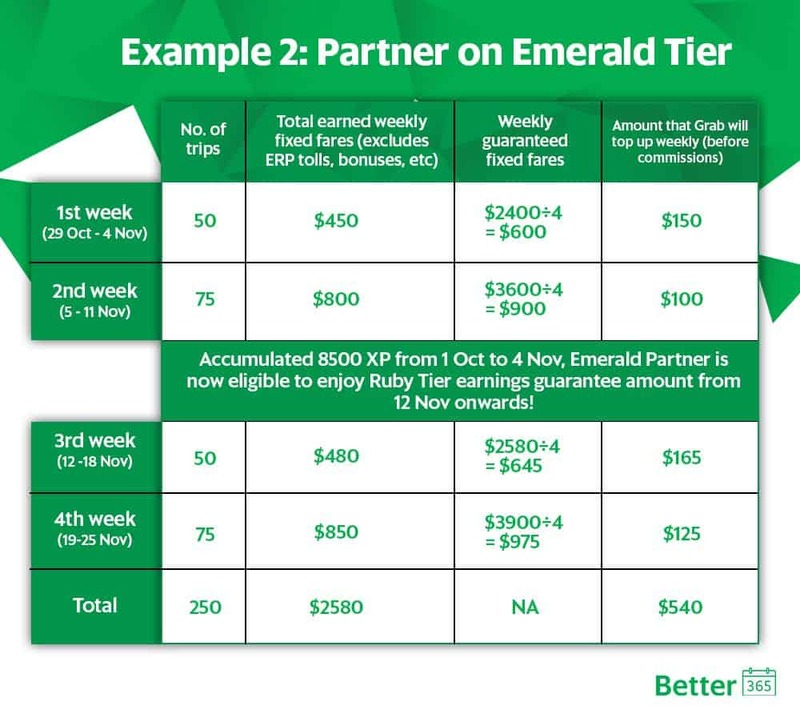 You will be able to enjoy the Emerald tiers partner benefits. Please refer to this page for more details on Emerald Circle. Earnings Guarantee is effective from 29 October 2018 onwards. Earnings Guarantee is open to all GrabCar and GrabTaxi Driver-Partners. Earnings Guarantee amount is subject to the 20% commission for GrabCar drivers, and 10% commission for GrabTaxi drivers. Only fixed fare jobs, except those on MyDestination, will be included in trip counts and fares. 90% Acceptance Rate, 10% Cancellation Rate, and 4.3 average Driver Ratings requirements apply. Guaranteed amounts stated are before deduction of commission. Commissions deducted from the Earnings Guarantee top-up amount do not count towards Emerald Circle (XP) points. Upon opting in to Earnings Guarantee scheme removes each respective driver partner from Missions Scheme.